Somewhat surprisingly, summer is proving to be almost as quiet a season for houseplants as winter. There is a fair amount of growth going on, I suppose, but nothing to write home (or in a blog) about. My repotting is done, nothing needs pruning, nothing much is blooming. 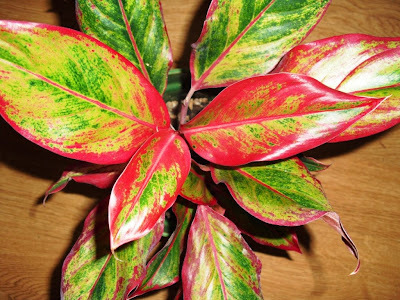 It seems that to a large degree, spring and autumn are where the indoor plant action is. Nonetheless, I have had a couple of things happen recently that pleased me, a couple of things that have me dismayed, and a birthday present that will wind up doing one or the other. I'm not sure yet. My Aglaonema 'Siam Aurora' is putting out new growth, not just from the existing crowns, but from the roots and stems. 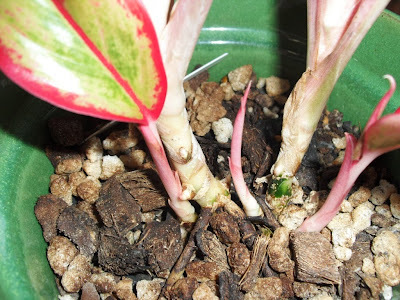 The pink shoot in the center is easily seen, but the bumpy areas on the stem to its left are also developing shoots. Previously posted picture of the whole plant. 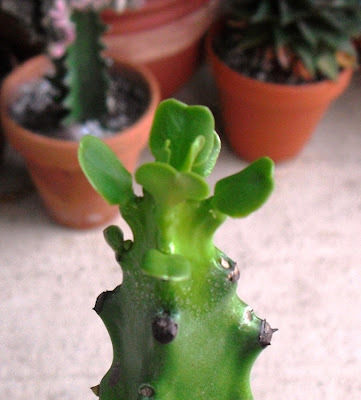 This unidentified Euphorbia is sprouting leaves for the first time in the three or four years that I've owned it. It has flowered regularly in the past, however. I didn't even like this plant at first--I only own it because it was part of a dish garden along with plants that I did want. It has won me over though. 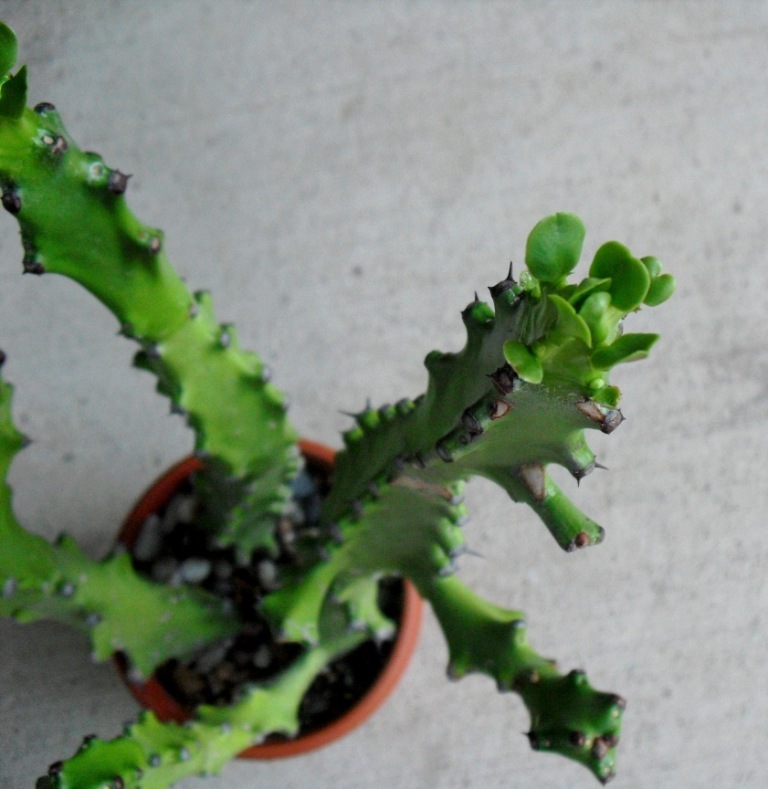 A picture of the same Euphorbia showing more of the plant. 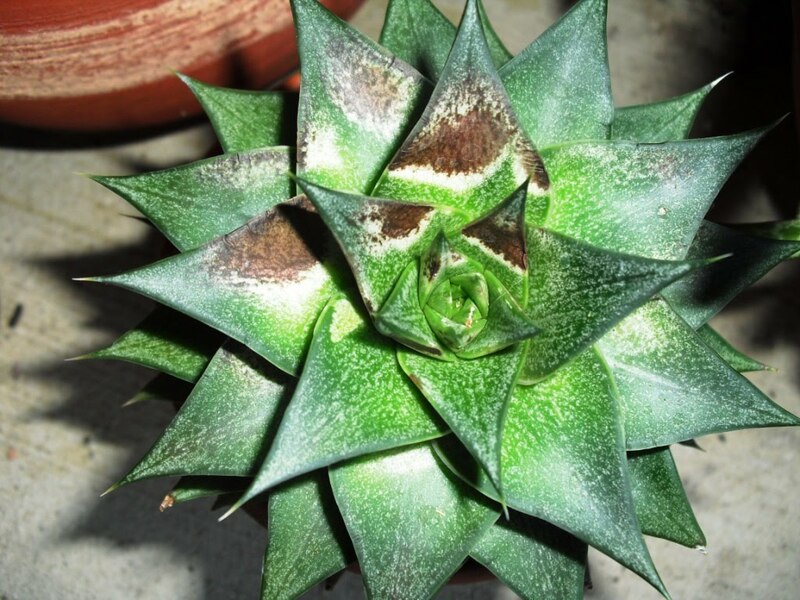 Even though I took care to introduce it to sun gradually, my Echeveria purposorum has developed an unsightly case of sunburn. 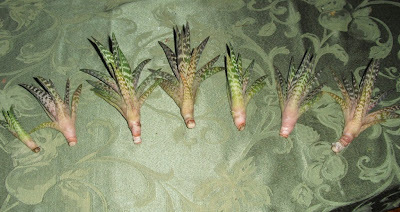 I should have trusted my instincts, and left it indoors with the Haworthias it so resembles. I pruned out the center plant in the clump late this spring, because the stem was weak, and would have broken off without support. (It is actually propped up against the door in the picture.) It is now rooting in a pot on my porch. The rest of the offsets were doing fine out in the sunshine until this week. Monday, after some heavy rain over the weekend, I was examining the outdoor succulents, and noticed that several of this plant's offsets were rotting. This surprised me, because this was this plant's seventh summer outdoors, completely exposed to the elements, and at least two of those summers were far, far rainier than this one has been. I'm wondering if pruning "Mom" away without removing the base of her stem introduced rot to the pot. I know absolutely nothing about Bonsai culture. 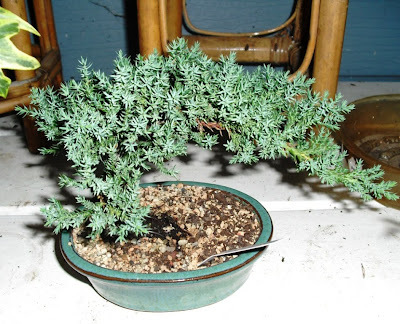 But I do know that this plant was purchased a decent nursery, is planted in fairly high quality bonsai medium, including bark and Turface, and is wired in place in its pot. So it is a plant of some quality, and not a so called "mall-sai." I hope I can learn its needs and keep my reputation as the Crazy Plant lady intact. I've got some work to do. You definitely have growth going on at your house. And I am sorry about your aloe rot. Maybe since you removed the mama it exposed more of the dirt and with that more water got to the roots. But look at all the new plants you will have now. That is great! 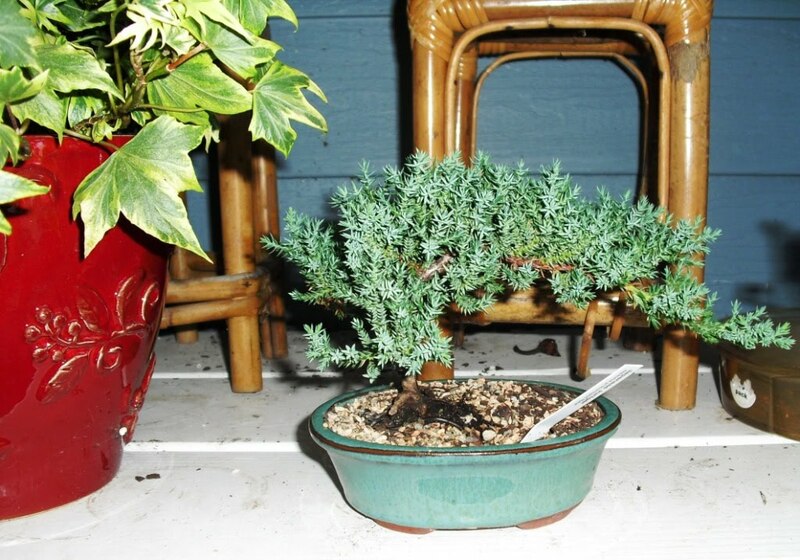 I don't know anything about Bonsai either. But what a nice present!